Cardiac tamponade is a life-threatening condition in which either a typical pericardial effusion (that is, the accumulation of an abnormal amount of fluid in the pericardial sac) or bleeding into the pericardial sac, disrupts the normal function of the heart. Cardiac tamponade can appear acutely or can develop more gradually. In either case, symptoms are usually quite striking, and the resolution of symptoms requires the expeditious removal of the excess fluid from the pericardial sac. How Is Cardiac Tamponade Produced? Cardiac tamponade occurs when increased pressure within the pericardial sac, caused by the excess fluid, becomes sufficient to restrict the filling of the heart during diastole. Since the heart can no longer fill completely, less blood is ejected with each heartbeat, and the heart has to work much harder to supply the body's needs. Furthermore, the blood trying to enter the heart tends to back up, producing congestion in the lungs and veins. The amount of pericardial fluid which is necessary to produce tamponade depends on to a great extent on how rapidly the fluid has accumulated. If pericardial fluid increases rapidly, the pericardium does not have time to "stretch," and the pressure within the pericardial space can increase greatly—even with a relatively small amount of fluid. On the other hand, if the pericardial fluid accumulates more gradually (say, over a period of days or weeks), the pericardium has time to stretch out to accommodate the extra fluid. In this case, the pressure within the pericardial space may not increase substantially until the pericardial effusion has become quite large, to the point at which the pericardium is incapable of stretching any further. The type and severity of symptoms depends on whether the tamponade has developed acutely or gradually. Acute tamponade is most typically produced by chest trauma, cardiac surgery or other invasive cardiac procedures, such as cardiac catheterization, or by aortic dissection. In all these conditions, blood can fill the pericardial sac in a matter of seconds or minutes, producing rapid and severe cardiac compromise. Because the excess fluid (that is, blood) in the pericardial sac accumulates rapidly in these conditions, tamponade can develop even with a relatively small amount of pericardial fluid. Symptoms are immediately striking and severe. 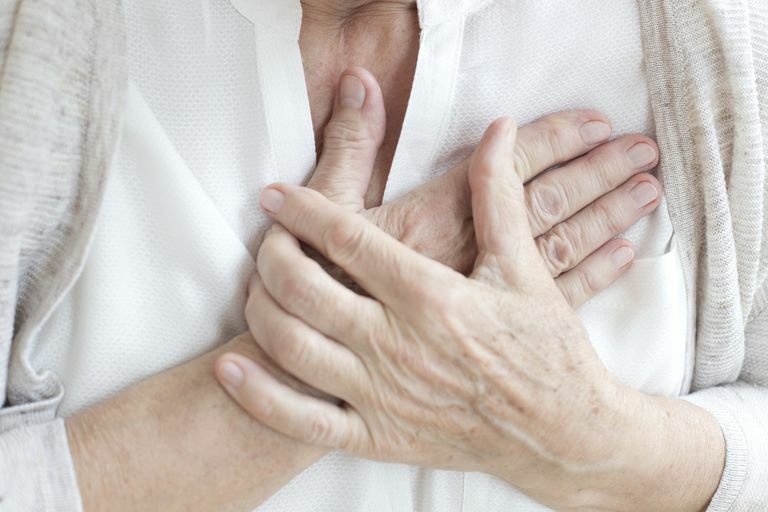 Chest pain, severe shortness of breath, and tachycardia and palpitations are common. Very low blood pressure may occur, along with abnormally cool skin, bluish skin discoloration, and a reduced output of urine. Acute tamponade is a medical emergency, and rapid death is likely if it is not treated quickly. Cardiac tamponade that results from conditions other than trauma, medical procedures, or aortic dissection tends to develop somewhat more gradually, usually over days or weeks. The pleural effusions in these "sub-acute" cases tend to be much larger than in acute cases since the pericardium usually has time to stretch out to accommodate the more gradual fluid accumulation. Symptoms are also less dramatic. Patients with sub-acute tamponade generally experience chest fullness or discomfort, easy fatigue-ability, shortness of breath with minimal activity, and edema in the legs and feet. But while symptoms may develop less dramatically than with acute tamponade, they can eventually become quite severe. This more gradual form of cardiac tamponade can also become fatal, and expeditious treatment is still necessary. The doctor will usually suspect cardiac tamponade by listening to the patient's symptoms, by the clinical circumstances (such as the suspected presence of any of the medical conditions known to cause tamponade), and by the physical examination. Additional clues can be obtained with a chest x-ray and an electrocardiogram. Once this condition is suspected, the diagnosis can be readily confirmed with an echocardiogram. The treatment of cardiac tamponade is to remove the excess pericardial fluid from the pericardial sac. The removal of fluid relieves the pressure within the pericardial sac and allows the heart to resume its normal function. The removal of pericardial fluid is usually accomplished by means of a pericardiocentesis—that is, draining the fluid through a flexible catheter inserted into the pericardial space. Alternately, fluid removal can be accomplished through a surgical drainage procedure. Surgical drainage is usually done if, in addition to draining the fluid, a biopsy of the pericardium is needed for diagnostic reasons. If the pericardial effusion comes back after it has been drained, a pericardiectomy (surgical removal of the pericardium) may become necessary to prevent further recurrences. As long as it is diagnosed rapidly and addressed quickly, cardiac tamponade virtually always can be treated effectively, and the long-term outcome usually depends mainly on the nature and the severity of the underlying medical cause. Maisch B, Seferovic PM, Ristic AD, et al. Guidelines on the Diagnosis and Management of Pericardial Diseases Executive Summary; The Task Force on the Diagnosis and Management of Pericardial Diseases of the European Society of Cardiology. Eur Heart J 2004; 25:587. Spodick DH. Acute Cardiac Tamponade. N Engl J Med 2003; 349:684.